ServersCheck introduces Data Center Infrastructure Monitoring (DCIM) features in its award winning Monitoring Software. DCIM allows server room & data center managers to monitor their room's environment and visually detect opportunities to save on one of the biggest costs they face: cooling. ServersCheck' DCIM solution is a flexible and modular solution where you only pay for what you really need. Sensors can be added as requirements grow. This makes ServersCheck one of the most affordable DCIM solutions on the market and makes DCIM fit in the budget of any company size: from large enterprises to small companies. SNMP & PoE sensors for monitoring temperature, humidity, airflow, shock, flooding, power failure and dry contacts. Features built-in SNMP agent, web server, email & SMS alerts. OLED display. 0U rack mount. simply create your server room layout map with Visio or similar, mark the position of the sensors on the map and save it. 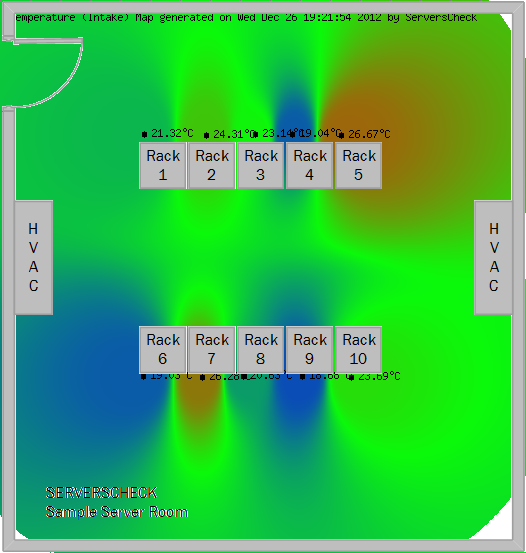 based on the saved positions of your sensors it will draw heat maps for under the raised floor, rack intake, top front and back of a rack and the ambient temperature.